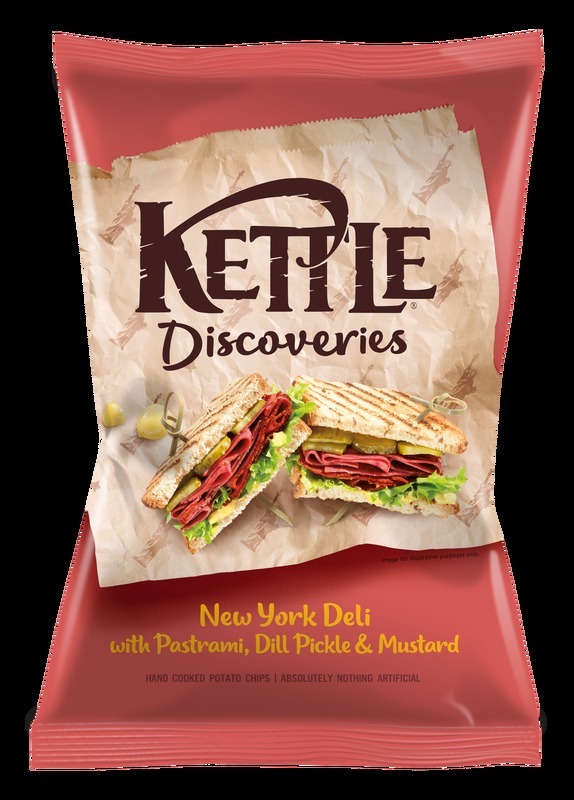 Kettle's Discoveries Range is all about weird and wonderful flavours, many of them innovative. It is therefore not surprising that they have gone for a twist on their usual packaging. Each 'Discovery' has a different backdrop, such as a sandwich bag or a chopping board. The logo is bold and dominant and the flavour combo appears in relatively small writing at the foot of the bag. Unfortunately, Kettle have gone for the least creative option of displaying their flavour content - the good old ingredients graphic. A near perfect balance between the Regular Crisp smash and the Handcooked thickness and brittle munch. They pulped at a reasonable rate, but never turned to mash. These were exciting looking Crisps. There were bends and curls, as usually seen with Hand Cooked Crisps. There was seasoning aplenty, and they were thickly cut with a fair few oil blisters. With so many flavours on the description panel it was hard to weed some of them out and work out if they worked together to create the flavour intention. First off, the Dill Pickle was the dominant flavour, and there was a hint of Mustard. The Pastrami was possibly evident, but overwhelmed by the other ingredients. The overall effect was however somewhat like the sandwich of its name. Having said that, when you order such a delicacy it often comes with a mountain of meat that works very well to balance the Mustard and Pickle out. Overall, this was a good attempt, but a plain old Dill Pickle would have been just as welcome.